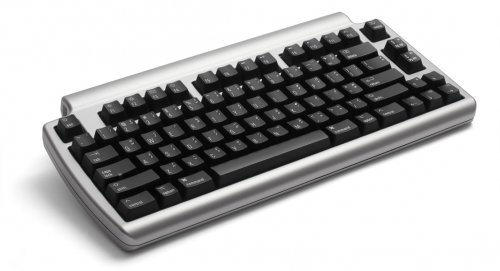 The world's quietest mechanical keyboard — the best Bluetooth keyboard. Without question, the best Bluetooth keyboard on the market today. Built from our Quiet Click mechanical keyswitches, you get the speed, comfort, and tactile feedback of a mechanical keyboard — without the noise. The compact form factor and wireless interface make it easy to use anywhere, and easy to take anywhere. Built from our Quiet Click mechanical keyswitches, they deliver a feel that’s unmatched for comfort — without sacrificing the tactile feedback you need to type really fast. 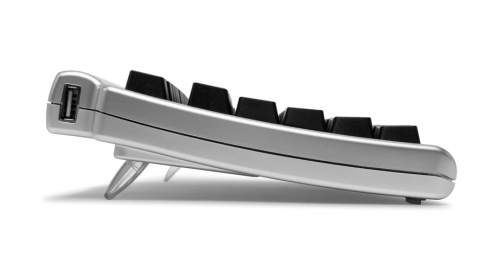 There are several benefits that come with a compact, wireless keyboard. More free space on your desk, and no wires to clutter it. Using your mouse is more comfortable — because you don't have to reach as far. No expense was spared to make this the best Bluetooth keyboard possible. That includes putting a much bigger battery in it than we had to — 1,600 mAh. That's big enough to last 6 months to a year, on a single charge (under normal use). The USB ports on the Laptop Pro let you do two things. 2) Charge up to 2 other devices, while you're charging the keyboard. How quiet is it? The Laptop Pro is no louder than a regular (non-mechanical) keyboard. Your co-workers probably won't even be able to tell that you have one. click for larger imageThe latest trend in keyboards is to have very flat & wide keys, with little or no space between them. You see this a lot on laptops and netbooks. While they look great, they can also be a little tricky to type on. The flatness makes it very easy to slide out of home row and lose your bearings. A Blue light will flash 3 times to indicate that it's On. An Amber light will flash 3 times to indicate Off. Hold down the Power button for a few seconds, until you see the Blue light flashing continuously. This keyboard is now ready to pair. What do the coloured lights mean? 3 Blue Flashes Three flashes of Blue indicates On. 3 Amber Flashes Three flashes of Amber indicates Off. Flashing The keyboard is in Pairing Mode. Red This indicates low power. Time to charge your keyboard. If power is very low, it may not show the Red light. Amber Your keyboard is charging. If power is very low, it may not show the Amber light until it's been charging for a few minutes. The light will switch off when charging is complete. A full charge takes about 5 hours, and lasts 6‑12 months. The Eject, Volume, and Media keys will not work on a PC. However, they will work if you are running Windows on a Mac, via BootCamp, Parallels, or VMware Fusion. They Alt and Windows keys have their positions swapped. Yes, but since it is a Mac keyboard, there are a few quirks, which are explained here. Where is the Clear / Num Lock key? The Mac OS doesn't need a Num Lock key, so it was re-purposed and re-labeled "clear". In calculator applications, pressing it will clear the value display, just like an C or AC button on a physical calulator. Where is the Help / Insert key? The Mac OS doesn't need an Insert key, so it was re-purposed and re-labeled "help". In certain applications, pressing it will bring up the help system. Apple no longer has Power keys on their keyboards, and we fear they will eventually discontinue support for it entirely, so we didn't include one. To bring up the Restart/Sleep/Shutdown dialog box, simply press Fn‑Control‑Up. Eject & Volume keys don't work. Anything I can do? Mac OS X Are you using USB Overdrive? If so, that's probably causing the problem. Please follow the instructions on this page... Restoring the Volume and Eject keys on Apple keyboards. Mac OS 9 The Volume keys will not work in OS 9. You can use the menu bar volume control instead. To get Eject to work, you need to download a special Eject utility that Apple released but is now discontinued. You can download it here. Microsoft Windows Unless you are running Windows on a Mac (via BootCamp or Parallels or VMware Fusion), these functions will not work. I'm running OS X and I have multiple drives that I want to be able to Eject individually. Anything solution? This will put an Eject icon on your menu bar. Can I use this keyboard to type German / French / other non-U.S. layouts? Yes, it can be remapped to non-U.S. layouts. 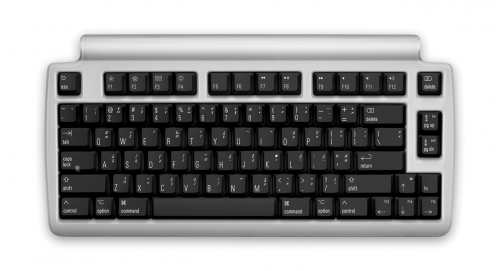 The letters on the face of the keys may not correspond to the new layout, but the keyboard will operate exactly as the selected (software) layout. Click on the International icon. Scroll through the list of available keyboard layouts, and click to select the checkboxes of the keyboard layouts you would like to have available to you. Select U.S. if you would like to use the standard layout. You may select more than one layout, if you wish to be able to quickly switch between different layouts. Click to select the checkbox at the bottom of the window, Show input menu in menu bar. The “Flag” menu in the top-right of the menu bar controls the active keyboard layout. It will list all of the layouts that were selected in step 4. Click and select U.S., or whichever layout you would like to use. Can I change the layout to Dvorak? Yes. However, we do NOT recommend that you remove the keycaps to configure it for Dvorak typing. Since the key heights and angles are different for each row, moving keycaps out of their standard positions will interfere with the feel of the keyboard. These keyboard layout files remap the main letter keys to the Dvorak layout, while maintaining the standard Option and Shift+Option key positions, so they match the Option Key Caps. These layouts will work with any keyboard, not just this one. We encourage you to download and try them on your system, before you make a purchase. Run a vacuum brush over the top of the keyboard. Alternatively, a compressed air can is also a good way to blow dust out from under the keys. Wipe the top and bottom of the keyboard with a damp (not dripping) cloth. If your keyboard is working properly, we STRONGLY recommend AGAINST deep cleaning it. These instructions are provided only for cleaning keyboards that are so dirty that they're not functioning properly — for example: sticking or non-working keys, etc. Deep cleaning will void your warranty, so if your keyboard is less than a year old, we especially don't recommend doing this. Better to contact us for warranty support instead. For a more rigorous cleaning, you can remove some of the key caps. This allows you to get under the keys and vacuum out anything missed by regular cleaning (for example, crumbs or larger bits of dust). Pull straight upward with the key puller, to remove each key cap. These keys must NOT be removed. You can clean under these keys by removing some keys around them. If you're not careful, you can easily damage the electronics from electrostatic discharge (ESD). It's difficult to re-assemble the case if you don't know how. It's not necessary for cleaning. After the key caps are removed, simply vacuum out any dust and debris from inside the keyboard. Do NOT use water. The key caps themselves can be cleaned by running them through a dishwasher. Wipe them down and let them dry out for a few hours before popping them back on to the keyboard. If the keyboard is so filthy that it appears to be a lost cause—as it might after a major coffee, soda, or Mai Tai spill—put it in the dishwasher. Place it in the top rack, dial the dishwasher to a rinse only setting, don't put soap in the thing, and run it through. Remove the keyboard and let it drain, with keys down, until it's completely dry—this could take a couple of days. This is controversial because some keyboard manufacturers suggest that you not do this as they won't guarantee that the keyboard will survive the ordeal—particularly if you hit the keyboard with really hot water, detergent, and flying cutlery. Speaking from personal experience, I've done this with a beloved Matias TactilePro keyboard that I'd given up for dead (this is the perfect condition under which to conduct this experiment). I'm happy to report that not only did it survive, it works perfectly (and is a whole lot nicer to look at than it once was).